As per usual, I stole the idea of doing posts like this from ViviannaDoesMakeup (and Lily Pebbles). 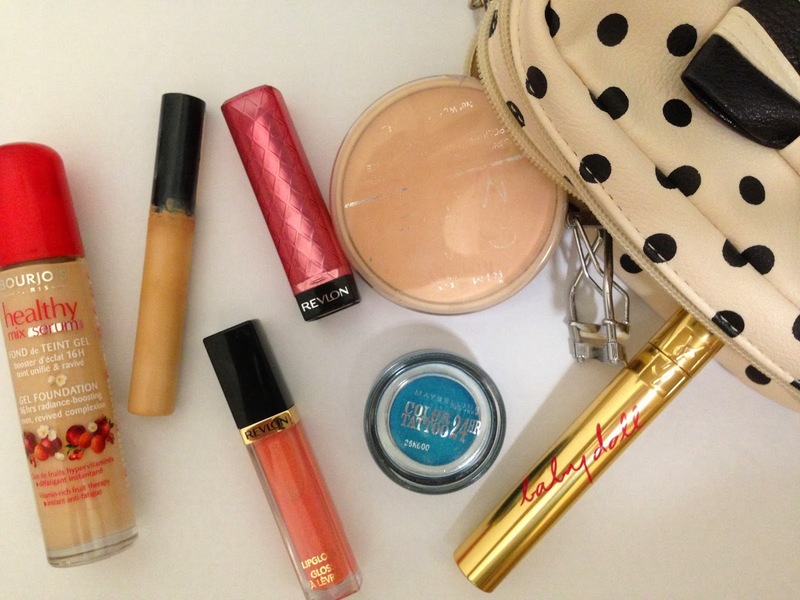 It’s basically a post to summarise what you’re planning on taking around with you in your makeup bag this month be it because you want to use something up or because you really love something! This first item in my bag (in a clockwise manor) is the Bourjois Healthy Mix Serum and my shade is 52 (even though it is a little bit light for me). I have actually spoken about this product in it’s own video before but since that video is privated, I’ll leave you a link to get to it here. I’ve been babbling on about how much I love the Wake Me Up foundation recently but I actually love this foundation a heck of a lot more. It’s a lighter consistency and I feel like it’s a lot nicer on my skin that the Wake Me Up foundation which leaves me feeling rather cakey. The next product I have is the Collection Lasting Perfection Concealer which everyone and their second cousin has! I won’t bother to go on about it so much because everyone knows exactly what it is but it’s perfect for pretty much everything! Following around the clock, the next product in my bag is a Revlon Lip Butter in Berry Smootie. I’ve been lusting after this shade of the lip butters for ages and the other day, I gave in and bought one because there was £2 off. I’ve previously said that I was disappointed with the lip butters after the state of my first one was terrible but I’m so glad that I gave them a second chance. This shade is exactly the colour of my lips so it’s perfect for everyday use! The best £6 I’ve spent in ages! We then have the Rimmel Stay Matte powder which I only have in the bag because I want to use up. I actually find this powder leaves me feeling rather cakey and not very good at all. I have a few ideas for what to replace it with but if anyone has any ideas then please let me know your suggestions! After my eyelash curlers, we have the YSL Baby Doll Mascara that I never seem to shut up about! I won’t say much now because I’m going to do a review of it on here next week so make sure that you’re following to be notified of when it’s up! After that, though, I have a Maybelline Colour Tattoo in Turquoise Forever. I never seem to shut up about these, either, and I am going to do a huge post on them soon but I wanted to talk about this shade on it’s own. It may seem a bit of a random shade to pick up but I picked it up to complete a makeup look for a makeup competition (which I’ll be recreating in a video very soon) but after having used it, I totally fell in love with this colour! It’s actually quite a subtle shade of blue and the shimmer in it makes it look really pretty! Finally, I have a rather old Revlon Super Lustrous lipgloss in Pink Crystals which I actually picked up off of FragranceDirect a while back for £2! I really love this colour because it’s subtle and makes my lips look a lot plumper and fuller. It also matches the Revlon Lip Butter really well, too!